Transdrives website is constantly being updated with more information on products so you our customer can make a more informed choice. If you are regular viewer of our website you may notice our new look and better navigation. Transdrive is a technical distributor of transmission products with our roots in DC from the textile industry and we have rapidly progressed over later years to include AC and Servo. We are independent and represent some of the biggest names in power transmission our technical sales staff await your enquiries and will give impartial advice and technical help on all aspects of drive systems. If you have any comments or would like any further information I can be contacted by phone, fax, e-mail or online enquiry form. running. Over 20 years of designing, building and supporting drives systems. Account - (new accounts on average take between 2 and 5 days to open and would have to be open before work commences). Pro-forma - only for fixed price contracts. Cheque - on completion of work. Credit Card - all major credit cards accepted on completion of work. 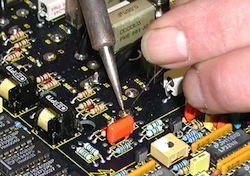 Transdrive offer a complete Repair Service for electronic and mechanical products sold, we also support this service for electronic components with the availability of a fully trained Service Engineer who can remove, replace and commission AC/DC Drives and then organise the repair of the failed unit either in-house, by the product manufacturer or a specialised repairer. Most of the manufacturers we represent offer bespoke repair services for their own products for example Wittenstein Servo Gearboxes (formerly Alpha Gearheads) offer an express service for the repair of Servo Gearboxes this can often result in a 24 hour service subject to spare parts being available. Leroy Somer can repair and refurbish their range of LSK DC motors at their facility in France returning the motor to “as new” condition at a large saving on buying a replacement. This is often done when a motor has failed and replaced with new the old motor is repaired and kept as a spare. Leroy Somer can also repair their range of gearboxes at the gearbox facility in the UK. We can offer a no obligation quote on most repairs so call our sales desk and one of our sales engineers will be happy to discuss your repair. If you have an enquiry or query about any product or service please fill in the form below and we will come back to you as soon as possible. 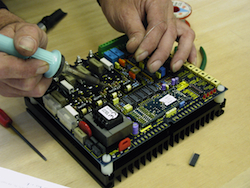 Transdrive offer Out of Hours Service for Access to Products and our Drives Service Engineer. Goods over 25kg may require additional personnel/forklift truck to handle, we charge a minimum of £75.00 for access to products out of hours and more if additional personnel are required. Note: All Out Of Hour Service is subject to personnel being available.